SESAME SEED “Beauty and Energy” The name comes from Arabic, simsin; or from jaljala which means” echo,sounds”, referring to the sound the mature seeds make in their casing. Sesame (Sesamum Indicum L.) is an oleaginous plant cultivated for its edible seeds. This annual growing plant reaches a hight of 50 to 120 cm, with opposite leaves of 4 to 14 cm long with an entire margin, they are broad lanceolate, at the base of the plant, narrowing to just 1 cm broad on the flowering stem. The tubular flowers have a four-lobed mouth and are yellow, though the color can vary with some being blue or purple. Despite the fact that the majority of the wild species of the genus Sesamum are native to sub-saharan Africa, Bedigian demonstrated that sesame was first domesticated in India. Sesame seeds were transported to America by slaves from the Middle East and Africa. This seed is also known by its African name ”benne”. With time its cultivation extended to other tropical and subtropical regions of America, to Africa and additionally to mediterranean countries. Sesame has been cultivated for thousands of years by the people living on the shores of the rivers Tigris & Euphrates. Women of ancient Babylon ate a mix of honey and sesame seeds, to extend their youth and beauty. Soldiers in Rome used to eat it to build strength and energy. Bedigian (1984, 1988, 1998, 2000, 2003) demonstrated that sesame was first domesticated in India, citing morphological and cytogenetic affinities between domesticated sesame and the south Indian native S. mulayanum Nair., as well as archeological evidence that it was cultivated at Harappa in the Indus Valley between 2250 and 1750 BC, and a more recent find of charred sesame seeds in Miri Qalat and Shahi Tump in the Makran region of Pakistan. When the sesame opens, after two weeks of sun drying, the seeds are dry and ready to harvest. First, the sesame is submitted to a moisture level test, then the plants are picked off the ground and the seeds are extracted using a blowing method, which eliminates any foreign material. Then the seeds are shipped to storage where they undergo a more intensive cleaning process. IMCO uses specialized machinery that completely removes any metals and other foreign objects. This process guarantees the best selection to achieve the ISO 9001-2000 standards. The clean seeds are analyzed to certify purity as “Fair Average Quality”. In addition to this, we maintain the highest levels of hygiene, and all of our packaging is strictly supervised, with personal attention given to shipping by land or overseas. We always keep close contact with the producers and distributors in order to be informed about the latest crop details. 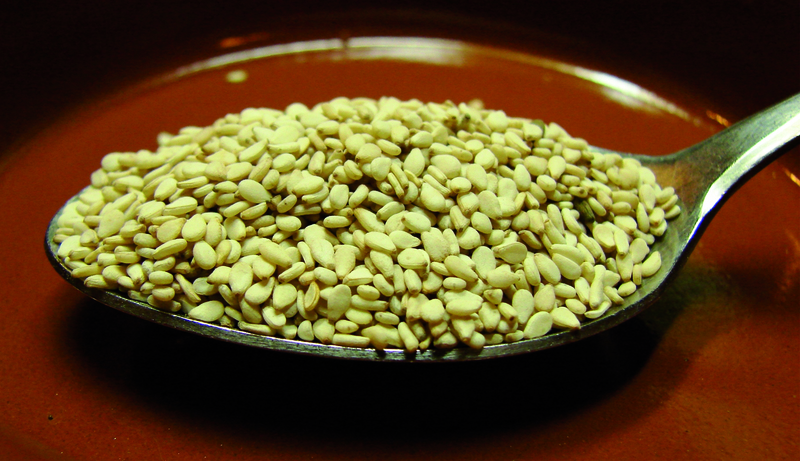 Sesame is grown primarily for its oil-rich seeds. The small sesame seed is used whole in cooking for its rich nutty flavor and also for its oil. Sesame seeds (raw or toasted) are used to decorate cookies and breads, such as bagels and hamburger buns. They can be baked into crackers and are also sprinkled onto some sushi style foods. Whole seeds are found in many salads and baked snacks. Due to its high level of natural oils (55%) sesame helps to keep the skin soft and moist. The seeds help to reduce our cholesterol levels due to its unsaturated fat and high lecithin content. Moreover, it is also rich in proteins and methionine, an essential amino acid. Furthermore, the seeds are very rich in calcium, iron, zinc, and fiber; and they also have anti-cancer and anti-oxidative properties. The nutrients are better absorbed when seeds are toasted or ground. En la actualidad comercializamos una amplia variedad de productos agrícolas en México y en el mundo. ¿Por qué no te pones en contacto con nosotros?